Project obstacles and solutions: The U.S. 31 Project connects the cites of Indianapolis with South Bend, Indiana with a new freeway. When completed, the project will convert 122 miles of a split lane highway into a freeway with no stop lights or unramped exits. The rebuilding of southern-most portion of U.S. 31 included seven new bridges from the off ramp of I-465 East in Indianapolis to the intersection of 116th Street in Carmel, Indiana. E&B Paving was the general contractor for this project and Havlerson Construction finished all of the concrete bridges. There was a push to complete seven bridges during the fall of 2015. 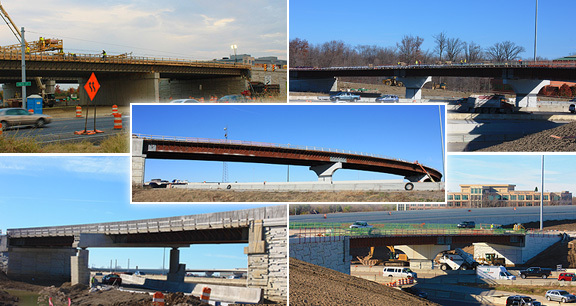 Three of these bridges were a part of the I-465 East to U.S. 31 North off ramp. Four others were part of the U.S. 31 overpass at 106th Street and 116th Street in Carmel. This section of the highway carries some of the heaviest traffic and INDOT wanted to open the highway for traffic before the winter season halted all paving. All seven decks were poured within 60 days. IMI supplied 5,000 yards of a class-C cement mix with a 4 inch slump for the decks. Most of this work was done during the night or very early in the morning to accommodate traffic patterns. In any bridge deck, flexural strength is a concern. INDOT requires a 5.50MPa. IMI was able to deliver concrete that was meeting a 6.2 -7.0 MPa at 7 days. For more information on strengths in concrete, contact the IMI sales representative for the location nearest you. Click here.